Seating first come, first served! 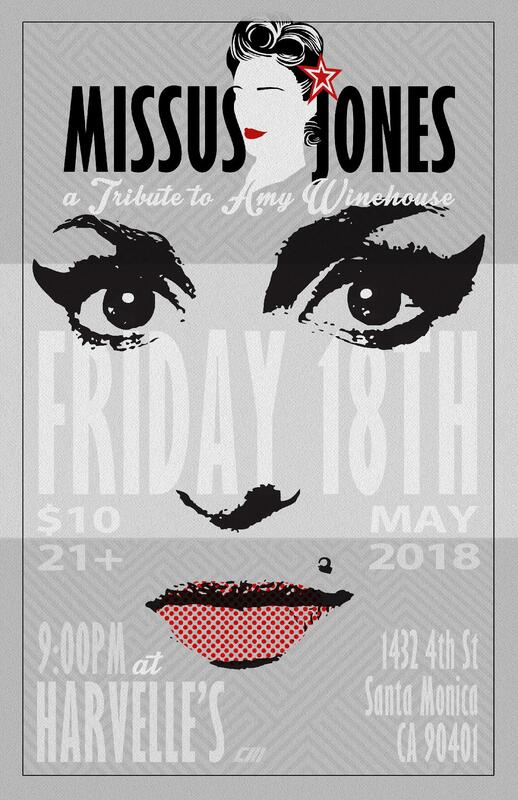 Missus Jones A Tribute to Amy Winehouse: We are a band that is a tribute to the late Ms. Amy Winehouse. Missus Jones was formed in November 2012. Members: Sonnet Simmons, Steve Chavez, Emile Poree', Chuck Orozco, Akane Tada, Patrick Simon, Rick Landeros, Josh Welchez, Nick Gomez, Michelle Lane and Shant Keuroghelian, Joe DiFiore. To say the alternative hip-hop group Wylde Bunch blazes trails is an understatement. Comprised of family members and long-time friends, the South Central Los Angeles natives have pioneered a sound infusing elements of funk, soul, rock, and world music into an incredible hip-hop sound. "Nothing is what you expect and everything raises the hip hop standard" says 1340 Mag’s Mark Fisher. Strengthened by an amazing off-the-hook live show that rocks beyond description they have become known on the live circuit as the “alternative hip-hop band”. Bonded by blood, friendship and a love for music, most of the members of Wylde Bunch started off as schoolmates. Raised in a city racked with social ills and the complexities of a relentless gang culture, the boys rarely went to weekend and evening outings or parties. Nighttime activity always revolved around the band. Nevertheless, the group, known for their practical jokes, party crashing, and enough charisma to fill the Staples Center, found sanctuary during jam sessions at the family home of emcee and producer, Dame. Consequently, the frequent private performances began to produce some mind-blowing results. By high school, the blossoming musicians became bored with playing standards and current popular tunes. They began writing and performing their own joints, as well as generating independent CDs. This early music impressed people to the point where they started receiving paid gigs. The mischievous bunch of teens, now maturing into men, moved their act to the club scene. This transition was carefully chaperoned by the band’s elder, “Popz,” who saw to it that the adult clubs did not unleash their various “distractions” on the band. Wylde Bunch rapidly grew into an established local hip-hop crew, garnering a solid following that eventually captured the interest of the music industry, leading to their critically acclaimed major label debut CD Wylde Times at Washington High on Sony. Wylde Bunch has created an undeniable niche with their explosive sound. If there is perhaps a misperception by some that live bands aren’t a part of hip-hop, Wylde Bunch is seeing to it that myth is destroyed. Also, Ish and Dame, the main producers of the group, work through their own production company, The Drop Squad. When they have any down time from the band, most of the members have made a point to return to childhood schools in Los Angeles, teaching music at schools lacking in funds. Giving back to the community is of the utmost importance to this inner city band. Their story and journey was even big enough to land a spot on “The Oprah Winfrey Show” featuring Wylde Bunch member Dame. They have since been a part of a series of tours, television appearances, major collaborations and features.